Sara Murray had never met her mother’s parents and was surprised to learn after her death that they were Amish living in Pennsylvania. When she is finally able to make the trip to meet them, she is shocked to learn someone else has been living with them and pretending to be Sara. Sara can’t understand how quickly her grandparents are willing to forgive the impostor. Secrets and deceit seem to follow Sara, and she is so tired of it. Though soon she meets Brad Fuller who is visiting her grandparents for during Christmas. She likes him a lot, but even he seems to pull away from her, not being totally honest. 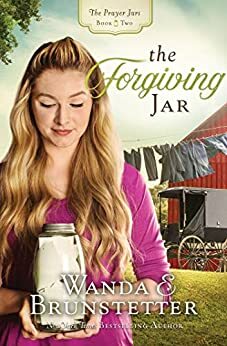 Struggling, Sara finds an old canning jar hidden in the barn that is full of encouraging prayers. Can Sara find a way to forgive the past and move on to building new relationships? So beautifully written this book, The Forgiving Jar, had me turning the pages every chance I got. It had every element I love to read about, forgiveness, faith, love, a little mystery, and last but not least understanding. At every turn the hopes of forgiveness was at the forefront. With the circumstances you can completely understand on how forgiveness might be a little slow in coming. Especially without the help and power of God. Sara's grandparents are so nice and loving to all. There home is open to visitors and family. They genuinely care about everyone. I would love to be a part of their family too! This is the second book in this series but you can read it alone without any problem. A great great read! Makes me want to start my own jars! I received this book from Netgalley. I was not required to write a positive review.